Enjoy a nature-oriented coconut bowl set that’s beautiful, durable and practical! 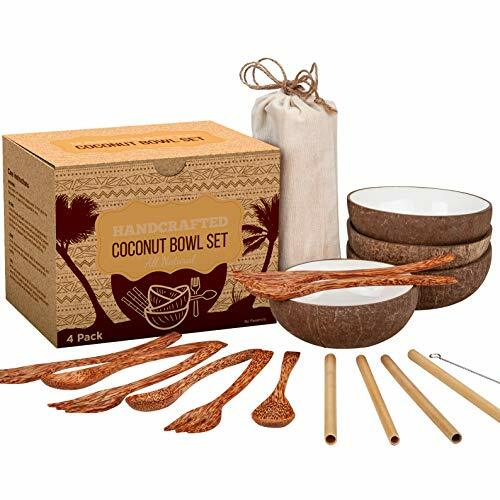 An all-inclusive, complete coconut bowl set with all the extras you’d want to meet your environmental expectations in a single package. The set comes in a beautiful box  so you can give this as a gift to a friend or that nature-lover in the group. Make sure to check your mail for a beautiful collection of 10 awesomely vegan recipes to satiate your vegan appetite, including creamy smoothies , delicious fiesta bowls 陋 and sweet desserts .  We also offer a money back guarantee: We’re that sure that you’ll love the set, 100% refund if not. Period. Note: Do not use the coconut bowl with substances at or below 40 °F as this may damage the paint (either way, damaging the paint does not pose a health risk and is merely an aesthetic issue). 便 ORGANIC WHITE-PAINTED SURFACE – Covered with organic, food-safe white coating to give the coconut a unique, elegant look, and make the coconut highly-durable, prevent rotting and last longer than untreated coconut wood.  SUPER-PACKED SET, ALL INCLUDED – 4 coconut bowls, 4 wooden spoons, 4 wooden forks, 4 reusable bamboo straws, a straw cleaner, and a canvas pouch so you can carry them all! A carefully-assembled set to fulfill all your expectations as an environmentalist or green soul. All this love is packaged in a beautiful box so you can give it as a gift to a cherished friend. 綾 10 AWESOMELEY VEGAN RECIPES – Free e-book available for download after purchase to satiate your vegan appetite, from creamy smoothies  to fiesta bowls 陋 and sweet desserts . 100% vegan, 100% awesome. Yum! 爐❤️ HANDCRAFTED WITH LOVE – Just like you, each coconut bowl is unique and is unlike any other. Each coconut is created by nature and then sanded, treated, painted and polished by an artisan – all by hand – before it gets to you. ♻️ UPCYCLED ECONOMY – Instead of burning otherwise useless coconut shells, with your help we’re giving them a new life and purpose, and help create a healthier Planet Earth (the burning of coconut shells emits considerable amounts of CO2 and methane). So thank you! It’s like a 5-start Gilligan’s Island set! These are absolutely the most fun set of bowls ever! The outside is an actual coconut shell and the inside is a epoxy-like substance making the bowl easy to clean and about to hold liquids.The box arrives with a twine bow, adding to the fun effect. This would be a perfect gift for anybody.I have used the straws and they appear to be durable and easy to clean.I really can’t wait to have friends over to debut these bowls!